Heat oven to 350°F. Grease a large bundt pan. Divide biscuits and cut each biscuit into quarters. 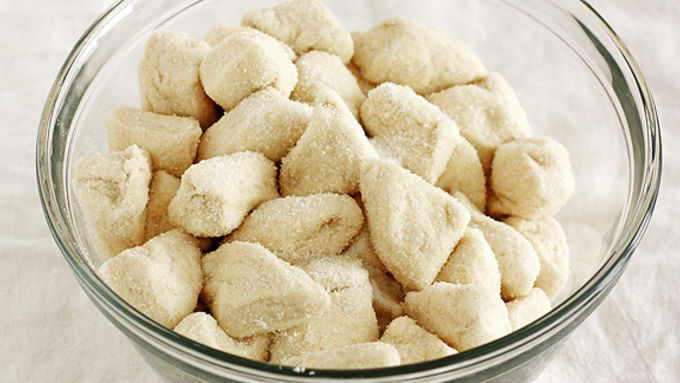 In a large bowl, toss biscuits with sugar until well coated. 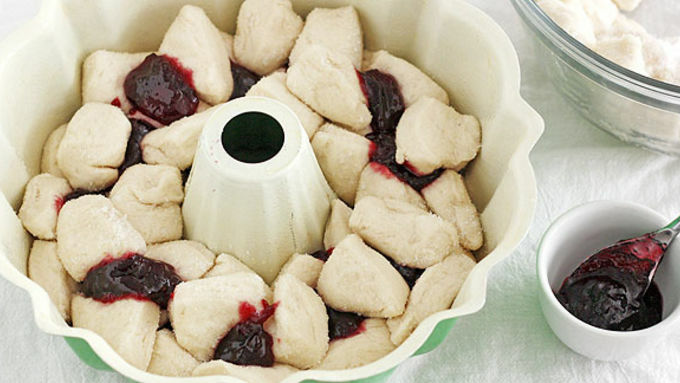 Place a layer of biscuits in bottom of prepared bundt pan. Top with a few teaspoonfuls of grape jelly. Top with another few pieces of biscuits, then top with remaining jelly (in teaspoonfuls). Top with remaining biscuits. Pour melted butter evenly over biscuits in bundt pan. Bake 30 minutes until center of bread is no longer doughy. Transfer to a cooling rack to cool 10 minutes, then carefully invert bread onto a serving plate. Let cool completely. To make the glaze, combine powdered sugar, peanut butter, milk and vanilla in a small bowl. 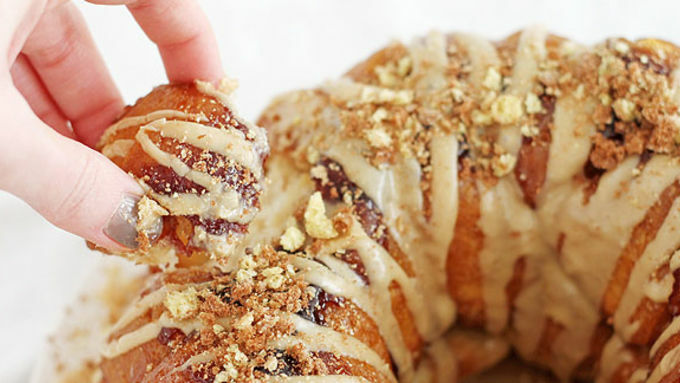 Drizzle over cooled monkey bread. Top with crushed cereal. 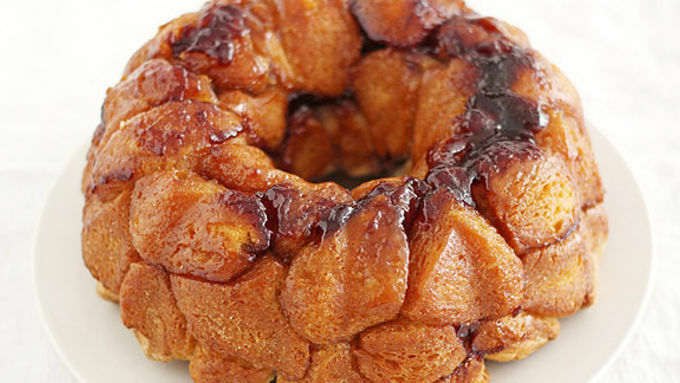 Wouldn’t it be nice if we could have our PB & J and our monkey bread together? Oh wait ... we can! 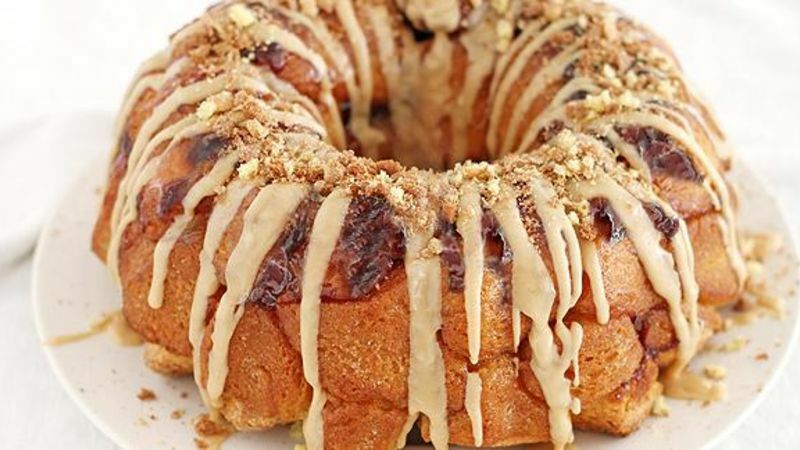 Thanks to the gloriousness that is Peanut Butter and Jelly Monkey Bread, we can enjoy the flavors of peanut butter, jelly, monkey bread (yes, that’s a flavor, and that flavor is delicious) all at the same time. Huzzah! First things first: Grab yerself some Pillsbury Grands! refrigerated biscuits. They’ll serve as our bread base. Bake until the center is no longer doughy, then transfer to a cooling rack for 10 minutes. Carefully flip the bread onto a serving plate and let it cool completely. Make a yummy-nummy peanut butter glaze, drizzle it over the bread and then top it all off with some crushed Reese’s Puffs cereal BECAUSE YOU CAN. Enjoy! I know I will.